The Spectator 5 Pc Reclining Home Theater Group with Lighting Cupholders by La-Z-Boy at Novello Home Furnishings in the Berlin, Barre, Montpelier, VT area. Product availability may vary. Contact us for the most current availability on this product. 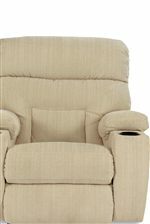 4SP784 Power La-Z-Time® Armless Recliner 1 23.5" 39.5" 44.5"
4AP784 Power La-Z-Time® Left-Arm Sitting Recliner 1 33" 39.5" 44.5"
4BP784 Power La-Z-Time® Right-Arm Sitting Recliner 1 33" 39.5" 44.5"
The Spectator collection is a great option if you are looking for Casual furniture in the Berlin, Barre, Montpelier, VT area.